Bob's Burgers has invited comparisons to The Simpsons in some quarters, but there's one crucial aspect where it differs: focus on the elementary school. Both shows may have grade school-aged children, but The Simpsons made the classroom a critical part of its environment; Springfield Elementary housed some of its most biting satire and best comedy. Bob's Burgers has occasionally used the school as a setting—for after-school activities, lunch, or trips to the guidance counselor—but school as a mechanism for learning? It really hasn't been done very often. I can understand why school's been on the backburner for the show. It's about the restaurant for one, and it's also that the weird things the weird kids are better than they would learn in school. The show acknowledges the latter with probably its best joke of the night, as Bob tries to convince Louise not to lazily hustle her way out of doing a science project this year: “Um, I don't know, to learn something?” he says, half-heartedly trying to buy in to the concept of public schooling. “YOU learn something!” Louise replies, which actually works on Bob—he can't bring himself to believe in school enough to try to convince Louise. Yet the Belchers' rejection of conventional schooling is what should, theoretically, make inserting them into a classroom setting work so well. Kids who don't care about a system they're told they have to be interested in? That's a comedy gold mine. Maybe not for Tina, too deferential and distractable, but the other two? Gene is utterly immersed in whatever scatology catches his attention, while Louise is justifiably certain that she's the smartest person in the room at any given time. That certainty is what gives “Topsy” its drive, and it's easily the best part of the episode. Louise has her science project volcano all prepared, and while Bob may be skeptical about the teacher accepting it for a second year in a row, she's sure she can convince the teacher. Which may have been true, but a substitute teacher directly confronts her, forcing her to do something new. This conflict is the best part of the episode: Louise is used to getting her way through sheer force of personality, but the sub also has his own force of personality, expressed through his devotion to Thomas Edison. He also has the power in the situation, and he forces Louise to bend to his will, at least temporarily. The rest of “Topsy” manages to support that tension, even if it isn't fantastic on its own. Louise, with the aid of a creepy/helpful librarian, discovers the famous video of Edison electrocuting an elephant, and decides to use that to crush the Edison-loving sub. This spins Gene off into a world of operatic storytelling, with Gail and Mr. Fischoeder, while Tina, playing the elephant, gets increasingly freaked out by the special effects Louise and Teddy set up to simulate the electrocution. This all works, but it doesn't quite rise to the premise of Louise, despite her intelligence and capriciousness, being forced to confront her powerlessness. 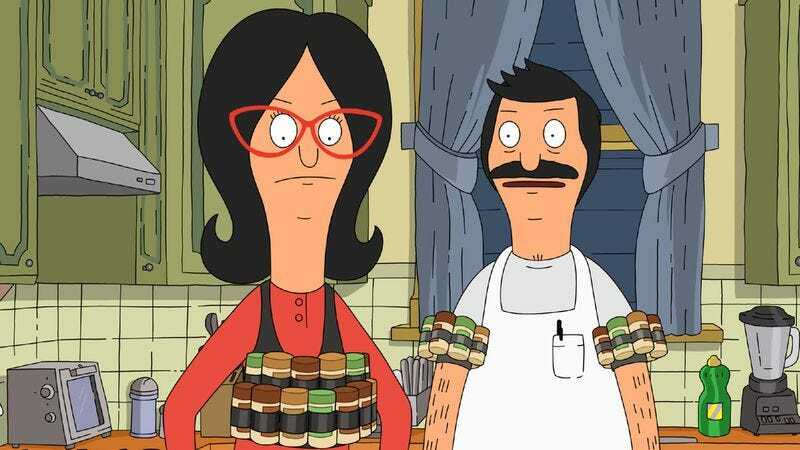 A side plot involving Linda and Bob battling over the best science project for wearing spices proves amusing as well, though it's interesting primarily based on how much time it doesn't take up. It's just a handful of quick scenes, barely worth calling a B-plot. Since Bob's Burgers has occasionally struggled with integrating all-kid plots with all-parent plots, I think it's good that this story's simplicity was recognized and treated effectively. It fits with the episode as a whole, I think: “Topsy” fiddles with the structure of Bob's Burgers, which is exactly the sort of episode that may lead to great things eventually. It just doesn't quite have that greatness in it itself. “I'm just here for the monthly rent! I say 'monthly' because I think there might be some confusion about that.” Kevin Kline is a lot of fun for near-throwaway parts like his tonight. I'm glad the show can make so much use of him. “Ta-daaaa! It's the spice rack!” All right, commenters: Spice Rack of Spiceps? I think Spiceps might be a teensy bit less likely to cause a disaster, so I'd vote Bob. “You son of a snitch! What's your favorite movie, Squeal Magnolias?” “War Horse.” This is a great example of Bob's Burgers' humor, I think—the movie pun could have been left on its own, but the muttered aside adds to the joke.